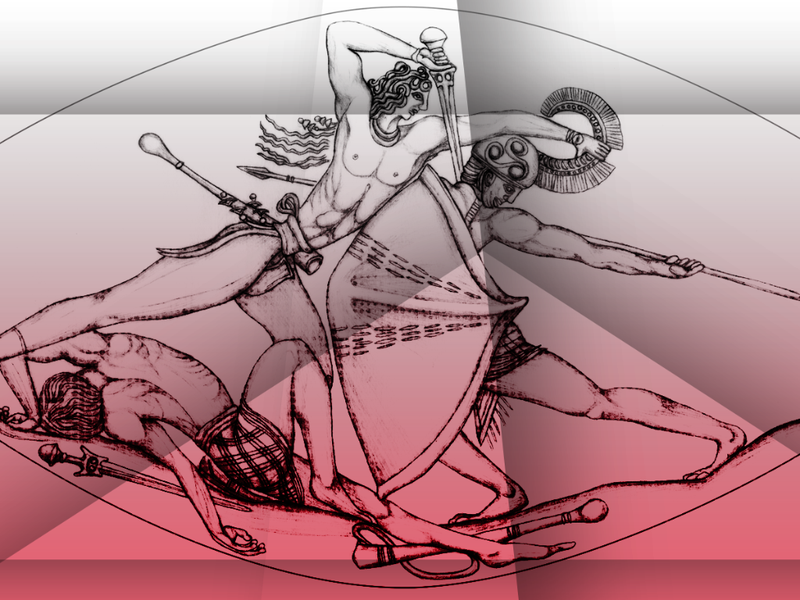 A drawing of the Pylos Combat Agate. Courtesy of Ben Gardner/the University of Cincinnati. The tiny carving has been dubbed the Pylos Combat Agate. It’s the tomb that keeps on giving. More than two years since its discovery, a treasure-filled Greek tomb has offered up perhaps its most significant find to date: a Minoan stone carving so sophisticated and detailed that it has forced art historians to reaccess their understanding of ancient artwork. Dubbed the Pylos Combat Agate, the sealstone carving is just an inch and a half wide, but its impact on the study of prehistoric art may well be enormous. “This seal should be included in all forthcoming art history texts, and will change the way that prehistoric art is viewed,” said Sharon Stocker, a senior research associate in the University of Cincinnati classics department, in a statement. She believes the stone, made by the ancient Minoans, is the finest-known example of prehistoric glyptic art produced in the Aegean Bronze Age. The Pylos Combat Agate. Photo courtesy of Jeff Vanderpool/the University of Cincinnati. The landmark find shows a warrior battling against two adversaries, killing one enemy, the other already dead at his feet. It’s the latest archaeological treasure to come out of the Griffin Warrior Tomb, discovered by the Davis- and Stocker-led team from the University of Cincinnati at Pylos in 2015, which was touted as the most significant Greek archaeological discovery in half a century. The Griffin warrior was buried around 1500 BC, about the time that the Mycenaeans, from mainland Greece, defeated the Minoans, a more advanced civilization from the island of Crete that had a massive influence on the Greek world. The presence of many Minoan artifacts in the tomb suggests a previously unknown degree of exchange between the two cultures. To date, archaeologists have catalogued some 3,000 burial objects from the Griffin Warrior Tomb, including a bronze sword with a gold-embellished ivory hilt; four solid gold rings; silver cups; over 1,000 carnelian, amethyst, jasper, and agate beads; fine-toothed ivory combs; and a golden dagger. “The whole tomb contains such a wealth of riches that it’s really very stunning,” Stocker told artnet News. “It’s extremely rare to find a tomb that wasn’t looted during antiquity or in modern times.” Amid the treasures, the seal, heavily encrusted with limestone that took over a year to clean, was almost overlooked, a tiny, apparently insignificant object. The Pylos Combat Agate before it was cleaned. Photo courtesy of Alexandros Zokos/the University of Cincinnati. “It was after cleaning, during the process of drawing and photography, that our excitement slowly rose as we gradually came to realize that we had unearthed a masterpiece,” wrote Stocker and Davis in the journal Hesperia, according to the New York Times. In Crete, such sealstones would be used to make impressions that would mark ownership. Placed on a bottle of wine, for instance, it would indicate that the seal was unbroken. In contrast, the Myceneans treated such sealstones as decorative objects, wearing them as jewelry. The Griffin Warrior was found sporting another sealstone pendant as a bracelet. Less is known about how such an object might have been made, as there is no evidence of magnification at existing archaeological sites for sealstone workshops in Crete. Theories include the use of rock crystal, or artisans with exceptional close-up vision, perhaps due to nearsightedness. Agate is also quite hard, making it difficult to carve.